Whispers in the Loggia: "Francis, Why'd You Want to Be Pope?" 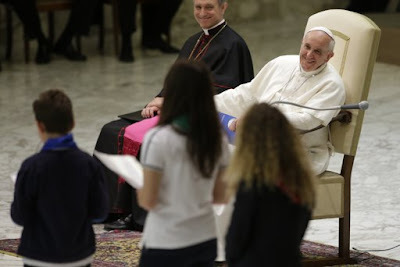 – In Student Q&A, Papa Bergoglio's Impromptu "Classroom"
"Francis, Why'd You Want to Be Pope?" – In Student Q&A, Papa Bergoglio's Impromptu "Classroom"
Earlier today, during a mass audience with students of the Jesuit schools in Italy and Albania, the Pope proceeded to make more news than was expected for the encounter by ditching his prepared text in favor of answering impromptu questions posed by some of the 7,000 kids on-hand in the Nervi. To be sure, the replies weren't exactly high policy discourses... on a summer Friday, though, it makes for fun watching – and in a modern papacy where symbolism is substance, a Pope's sudden upending of his handlers' arrangements to give off-the-cuff replies to unvetted questions is, whatever the context, still rather significant. Given the volume of the exchanges, the nature of a pontiff who distinctively prefers to be actively heard than casually read – and, indeed, Francis' Ignatius-spurred exhortation today to break with the "conventional" – the following is video of the first part of the "conversation," with a primitive audio translation layered over. The rest will go up as it's duly plowed through and uploaded. That said, as it's rather daunting to fill in on the turf one's beloved countryman – another onetime Jesuit – occupied for a quarter-century on the global stage, the temptation's admittedly pretty strong to maintain tradition and do the rest in Foley voce.